The Authorities of APPSC has announced the APPSC Group 3 Notification 2019 on 22nd Dec 2018. The aspirants who are willing to apply this Group 3 Notification AP have to about the 1051 AP Panchayat Secretary Vacancy, they have to do APPSC One Time Registration (OTPR) @www.psc.ap.gov.in. Here the aspirants will get the APPSC Panchayat Secretary Online Application Form registration dates and links. AP Panchayat Secretary Notification 2019: The Public service commission of AP is formulating to release the APPSC Group 3 notification. This is a good opportunity for the aspirants who are wanted to do a government job in Andhra Pradesh. Every year the officials of APPSC is recruiting the aspirants for these 1051 APPSC పంచాయతీ రాజ్ కార్యదర్శి పోస్ట్లు. This year also they are going to announce the APPSC Group 3 notification. So, the aspirants who are eligible for the eligibility given below of this page that is prescribed by the officials of Andhra Pradesh Public Service Commission that candidates apply to this APPSC Panchayat Secretary Grade 4 Notification through the online @recruitmentindia.in. APPSC పంచాయతీ కార్యదర్శి Recruitment 2019: The aspirants should know that the candidates who want to apply this AP Group 3 notification, some necessary qualifications should be possessed by the candidates.candidates should have completed the Graduation from any recognized university. And also the candidate’s election process for these APPSC Group 3 1051 Vacancy based on three rounds they are, first one is APPSC group 3 prelims/Screening Exam and the second one is mains examination and the third one is final interview nothing but certificate verification. As per the AP Group 3 Selection Process, the officials of the Public Service Commission of AP has released the Panchayat secretary Syllabus pdf. Download that syllabus. Have you noticed the APPSC Group 3 Exam Date? It is 21st April 2019. Yes, AP Panchayat Secretary Exam date is 21st April 2019. Education Qualification For Panchayat Secretary: The Candidates who wish to apply this APPSC Group 3 Notification for the Panchayat Secretary Grade IV posts that aspirants should possess any Graduation from any recognized university or board. For Panchayat Secretary posts: Who wish to apply the Panchayat Secretary vacancies, those candidates maintain the minimum age 18 years and the maximum age was 42 years. Otherwise, the aspirants not eligible for this APPSC Panchayat Secretary Grade IV posts. Check AP Panchayat Secretary Notification @ www.psc.ap.gov.in: The aspirants who are appeared for this APPSC group 3 prelims examination that candidates get the results very soon. The aspirants who are gone through the AP Panchayat Raj Secretary prelims exam that candidates are eligible for the APPSC Group 3 mains examination. The candidates who qualified in the APPSC Group 3 Mains examination that candidates are allowed to the AP Public Service Commission Grade 4 final interview along with certificate verification. Here we give the instructions to apply this APPSC Group 3 Notification. After the final selection who are joined in these posts will get the good salary package. AP Panchayat Secretary Salary is Rs. 16, 400 – 49, 870/-. AP పంచాయతీ కార్యదర్శి 1051 Vacancy: Hello, Aspirants, we know that you are eagerly waiting for the Group 3 Notification AP. For the sake of candidates the recruitment board Andhra Pradesh Public Service Commission is preparing to announce the various vacancies of AP Panchayat Secretary Recruitment. AP Group 3 qualifications matched candidates have to apply for this notification before 26th Jan 2019. For these posts, we explained all information on the above table like APPSC Group 3 Application starting and ending dates and job location And also, Andhra Pradesh Panchayat Raj Secretary mode of the registration process is online. Here the applicants also get the latest Andhra Pradesh Govt Job updates. 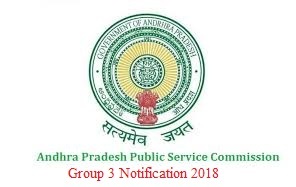 APPSC Group 3 Panchayat Secretary Exam Notification 2018: For the seeking of aspirants, the authorities of Andhra Pradesh Public Service Commission has published the APPSC Group 3 previous papers 0n official web page. Here the aspirants who wish to apply this APPSC Group 3 Notification that candidates first check the eligibility criteria information like age limit, salary package, by the way, the officials offered the comfortable package to the candidates who want to apply this Notification of 1051 APPSC Panchayat Secretary Posts and the applicants also check selection process, application fee. Here the application fee is different for all categories. The aspirants who satisfied these all instructions that candidates can apply this APPSC Panchayat Secretary Group 3 notification. The post APPSC Group 3 Notification 2019 | Apply Online For 1051 Panchayat Secretary Grade IV Vacancy @ www.psc.ap.gov.in appeared first on Recruitment India.